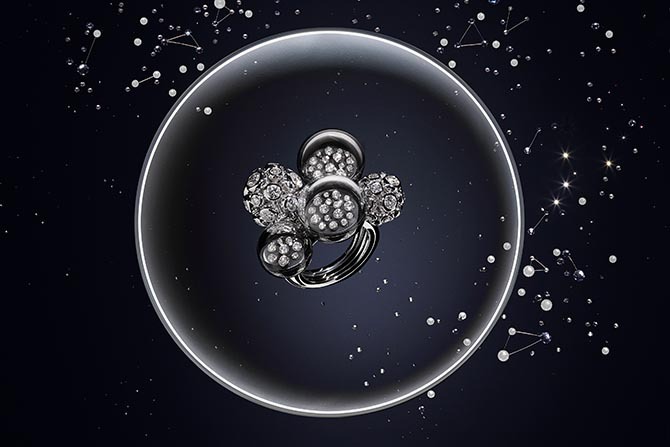 The romance of the moon and the stars have long been an inspiration for jewelry designers. 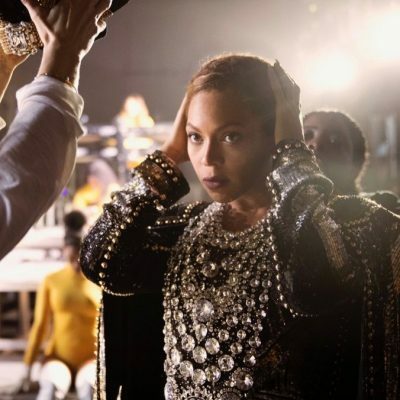 Cartier took the concept a step further with a new collection introduced this week at the Spring ‘19 Couture collections in Paris. 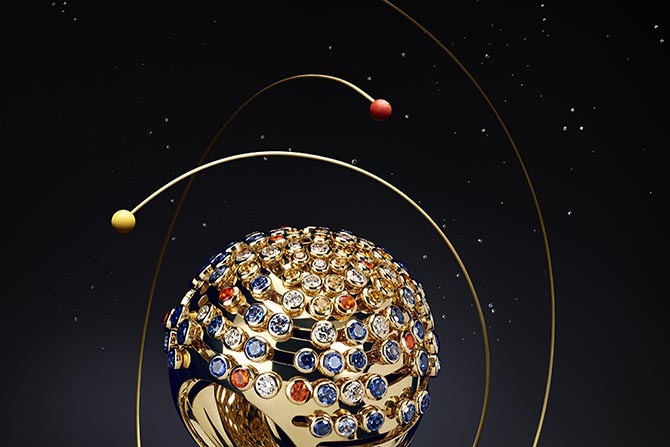 Les Galaxies de Cartier was inspired by the vastness of the cosmos. 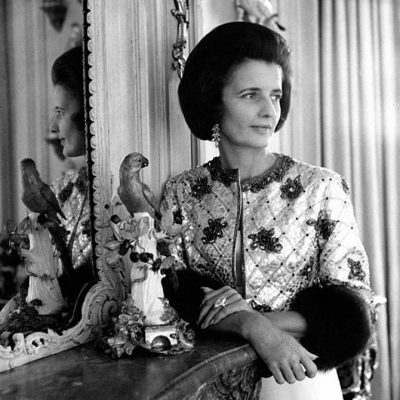 It’s a big topic to be sure that Cartier approached somewhat metaphorically. The limited-edition designs suggest astrological phenomenon with themes including The Alignment of the Planets, a Fractal Meteor, the Earth’s Lights and Trembling Stars. While it all may sound a little scientific, the pieces are dreamy and modern. Two qualities that not easy to balance in one jewel. See highlights from the collection that explores the final frontier and a few pictures from the dinner party in Paris where it was launched on Thursday at the Galerie de Minéralogie et de Géologie. The wide bracelet in the image at top and narrow bangle in photo above take their design cues from the Alignment of the Planets. 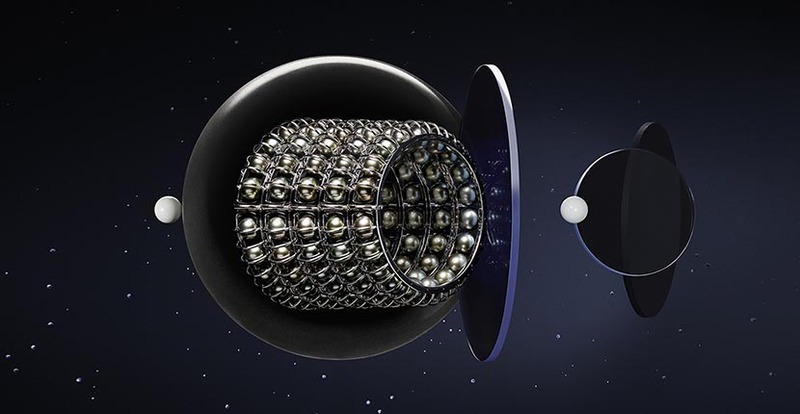 Cartier used peacock shades of Tahitian pearls to suggest the Moon, Mercury, Venus, Jupiter and Saturn in the night sky. 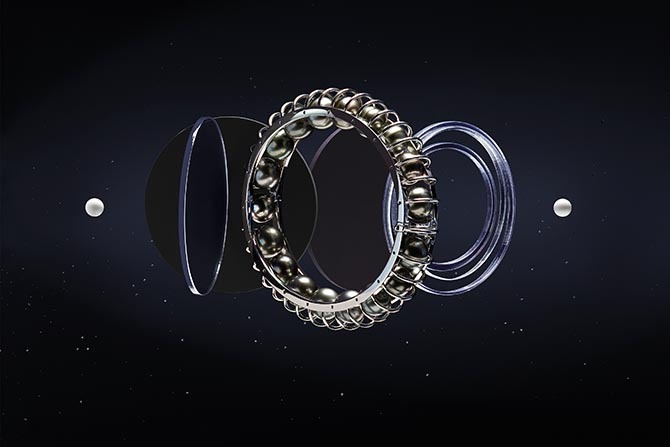 The black pearls all move or orbit around within the white gold cages. Golshifteh Farahani, Tilda Swinton and Sofia Coppola in front of the case displaying the Alignment of the Planets bracelets at the Les Galaxies de Cartier party in Paris. The Earth’s Lights ring was inspired by a view of our planet from the sky. Randomly placed yellow and blue sapphires as well as fire opal suggest the colors of life on Earth. The idea that we are all made from meteorites and asteroids which have crystalized over millions of years is the metaphysical theory behind that the Fractal Meteor bracelet. 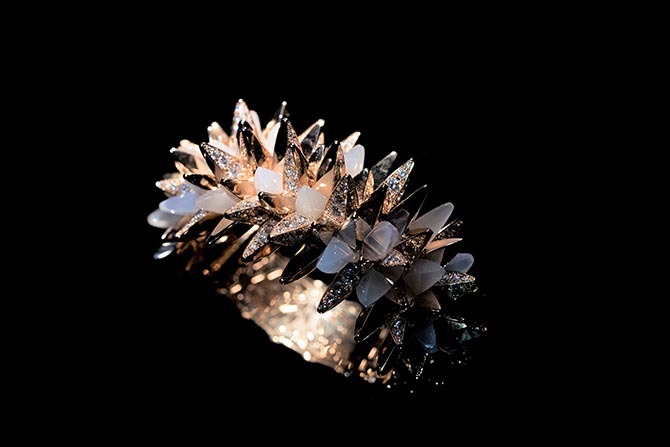 Spiky slices of peach moonstones and pink gold covered in diamonds form the parts of the sculptural jewel. 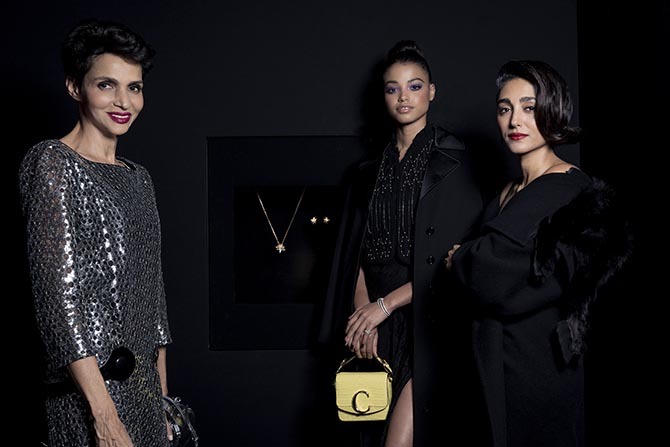 Farida Khelfa, Ella Balinska and Golshifteh Farahani in front of the case displaying the Fractal Meteor pendant and earrings at the Les Galaxies de Cartier party in Paris. The Trembling Stars ring represents the Milky Way. Diamonds under a crystal dome twinkle with movement. They are specially mounted in a Cartier technique called serti vibrant or trembling setting. Metaquartzite, a metamorphic rock with golden pyrite accents, acts as the black sky behind the diamond stars. 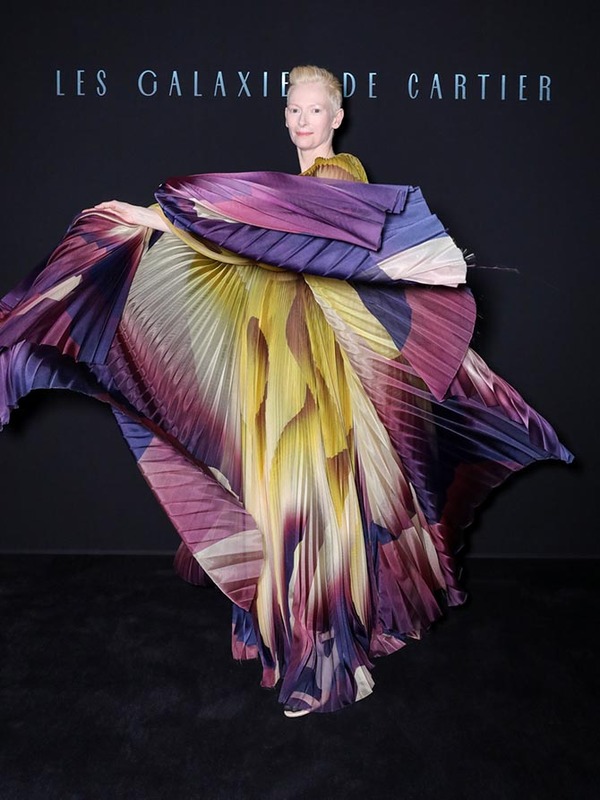 Tilda Swinton in Iris van Herpen Haute Couture gown at the Les Galaxies de Cartier party in Paris.